GSelector draws a thick line between fields that are global and those which are station specific. Zetta follows that approach. Zetta uses global fields to store data that are universally and objectively correct (such as Song Title or Artist, Duration of an asset or the Intro position). Station specific data, on the other hand, are where certain variance is required (for example Activation state, Category, Start/Stop dates/times, Last play date/time) and these will likely vary from a station to a station. While GSelector has a notion of “Format Parent” that provides some inherited traits between station data, Zetta takes a different approach. Zetta offers a concept of default station specific values, with the ability to override these on the station level. Here is how it works: Zetta has a concept of a virtual, “Default” station. The default station always exists in the system without a need to be defined by the user, but is only accessible in a handful of modules: Media Library, Metadata, and Mass Changer/Audio Utility – all asset management windows. Station specific values defined in a Default station’s Metadata are automatically shown as station specific values on each regular station. That allows the user to enter the value once, and “mirror” it into each station. What is the difference compared to global fields then? 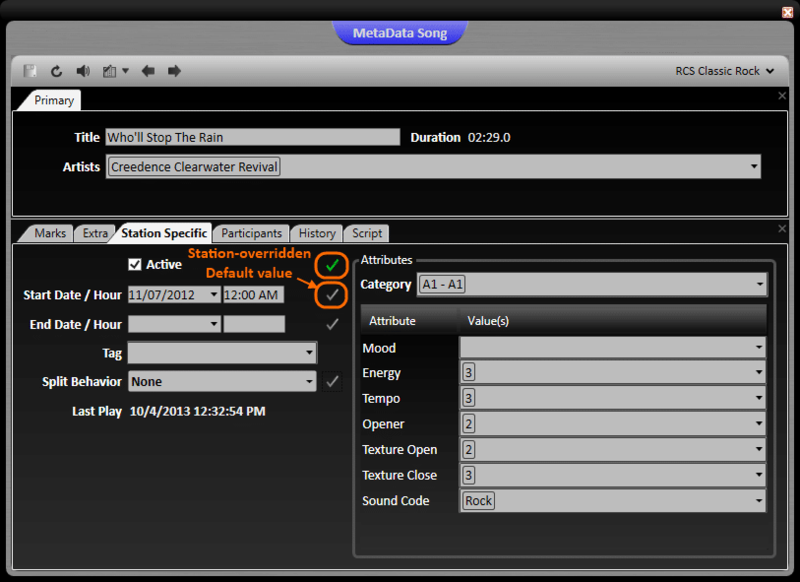 A Default value can be overridden for any song/link/spot on the station level. Here is an example: you enter a new song ABC into the system, and want it active on all your stations. You could either explicitly activate the song in each station, or you can just activate the song on a Default station, which will make the song active in all stations. If you later decide that the song needs to be inactive on a station X, you just need to override the inherited default value. You do so by unchecking the Active checkbox on that song’s Station Specific tab for station X. The song is still active for all the stations but station X. If you now deactivate the song on a Default station it will become inactive on all the other stations as well. If you later decide to reactivate the song on a Default station, it will become active on all the station but not station X (where we explicitly deactivated it before). Zetta remembers the specific activations. Note that when you decide that song ABC should really follow the default activation state, you can activate the song on a station X; it will become active again, but will not follow the default state, because we are still overriding the default value. This condition of station specific override, indicated by a green checkmark next to the station specific field. You can hover on the checkmark and the tooltip that appears will say whether the value in the field is a “Station Specific Value” (i.e. explicitly overridden), or an “Asset Default Value” (i.e. inherited from a Default station). Set as default: choosing this option copies the current state of the field from the current station to the Default station, and this removes the station override (like the Reset option above). If the song is explicitly inactive in a station X but active in a Default station, performing this operation will deactivate the song on the Default station (and in turn all other stations that were using the Default value) and also remove the station override on a station X. Although Category is a station specific field, we don’t provide a Default Category option. Choosing a Default station in Media Library will always list all assets, not just the ones that are active in a Default station. In Media Library only, we will change the word “Default” to “All”. If you spend a little time and play with the feature, you will see it is relatively simple, logical and powerful. More improvements are on the way. Zetta grows like a flower and each user helps us water this plant everyday with great suggestions.